The theme for this week's The Challenge it is Masculine inspiration. Every September my husband heads to Ontario for a fishing trip with his dad in Algonquin park. 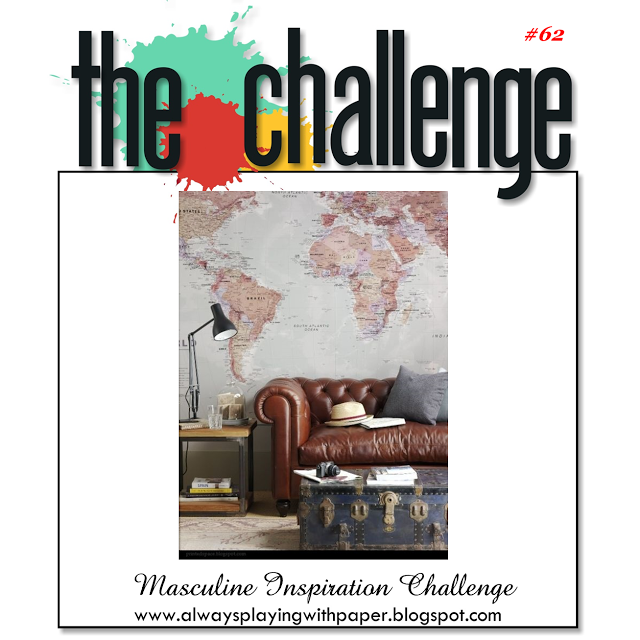 When I saw the big wall map in this photo I was inspired. I found this old map of the park and printed it off, I pulled some of the colours from the inspiration image for the matting and the fish bones. I used roughed up twine to hang the fish. The DP actually had faint script on it and was perfect as a background for the sentiment. Supplies: Cream, brown and craft cardstock, Designer Paper - Authentique, Clearly Besotted - Sentimental Type, Fish - Silhouette. I am always surprised at how fast time seems to fly, it the last day of February already. I will admit that I am loving the spring conditions we are having in Victoria though, the cherry blossoms, daffodils and crocuses are in full bloom. 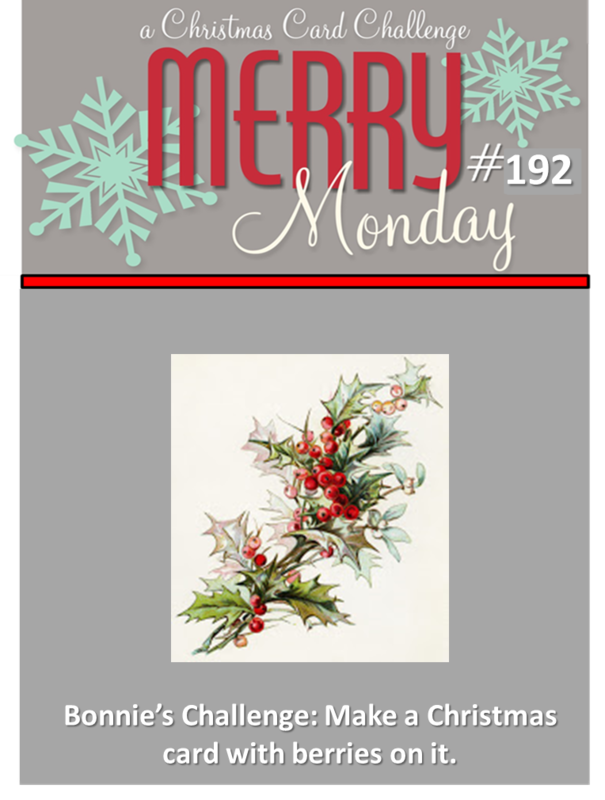 We have a new Merry Monday Christmas card challenge for you. Our hostess this week is Lori and we are to Make a Christmas card with a tropical theme. I wanted to try out my new Minc that my husband surprised with at Valentines day. 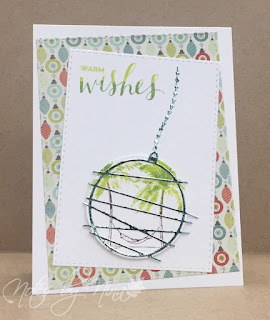 So I though I would create a tropical ornament for my card. I matched the Designer Paper to the colour of the foil. I stamped a little beach scene in behind. 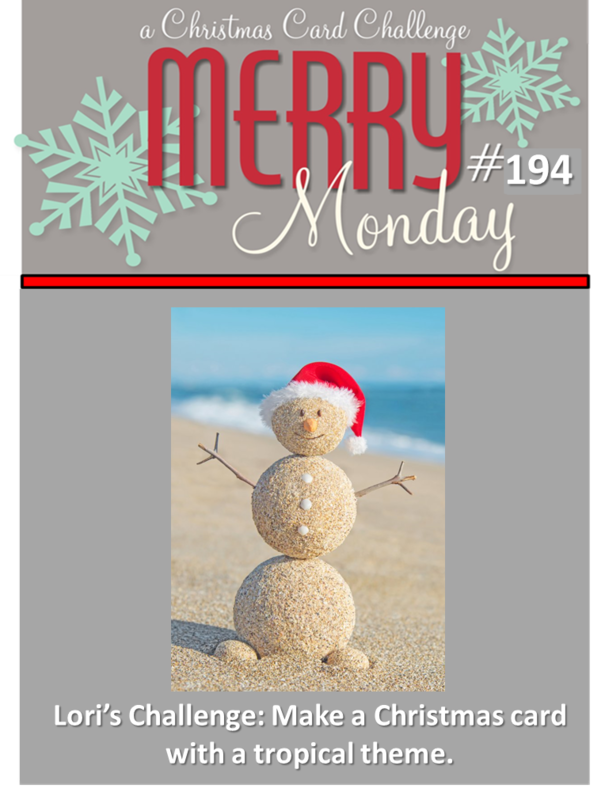 Supplies: White card stock, Designer Paper-My Mind's Eye, My Favorite Things - The Beach, Hand letter Holiday, SS Stitched Rectangles. 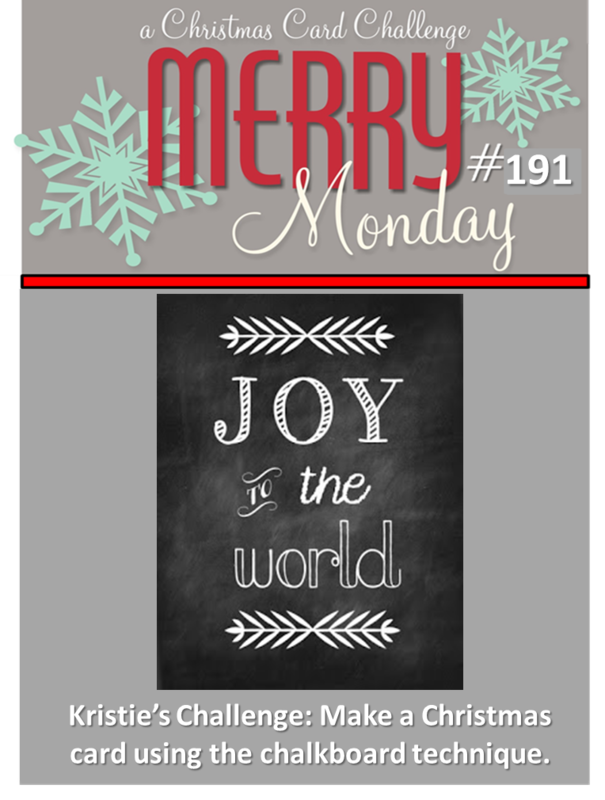 Take a look at what the Design team has created for inspiration over at the Merry Monday Christmas Card Challenge. The Challenge has a wonderful inspiration image for this challenge. I love the vintage style showcased. I love the soft colours and prints on this DP, all coordinating pages from a 6x6 paper pad. 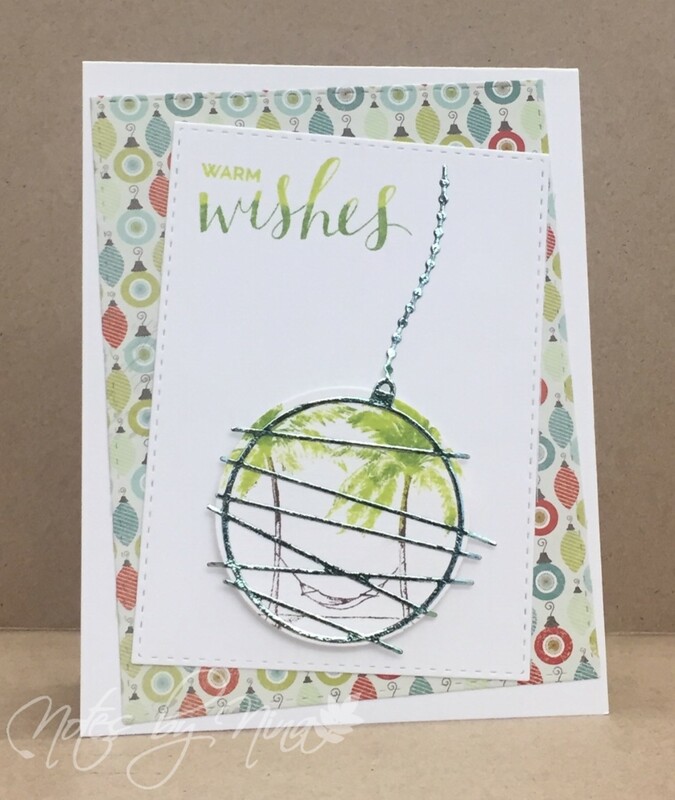 I used lots of layers as I could not seem to choose which patterns to use I added in a couple of die cut circle scribbles and finished with a flower. 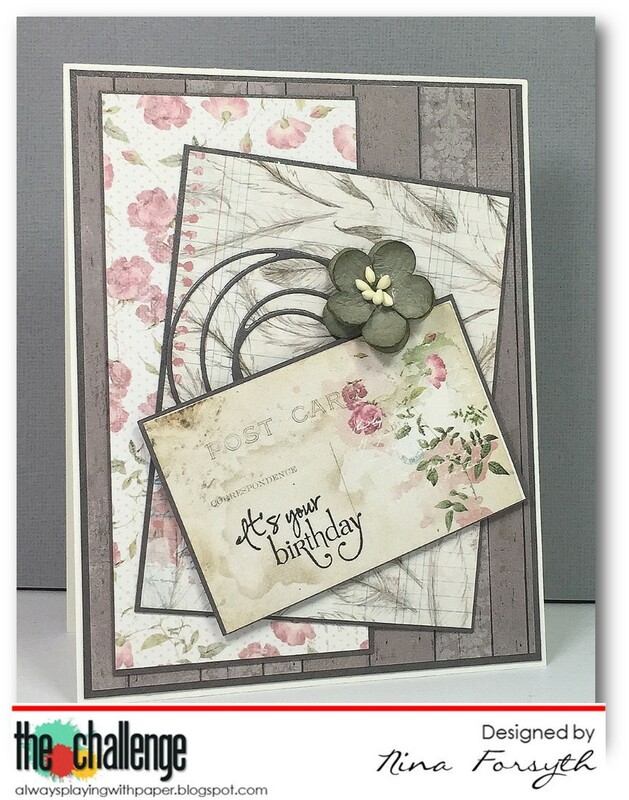 Supplies: White and card stock, Designer Paper - Authentique, SS Circle die cut, misc flower. 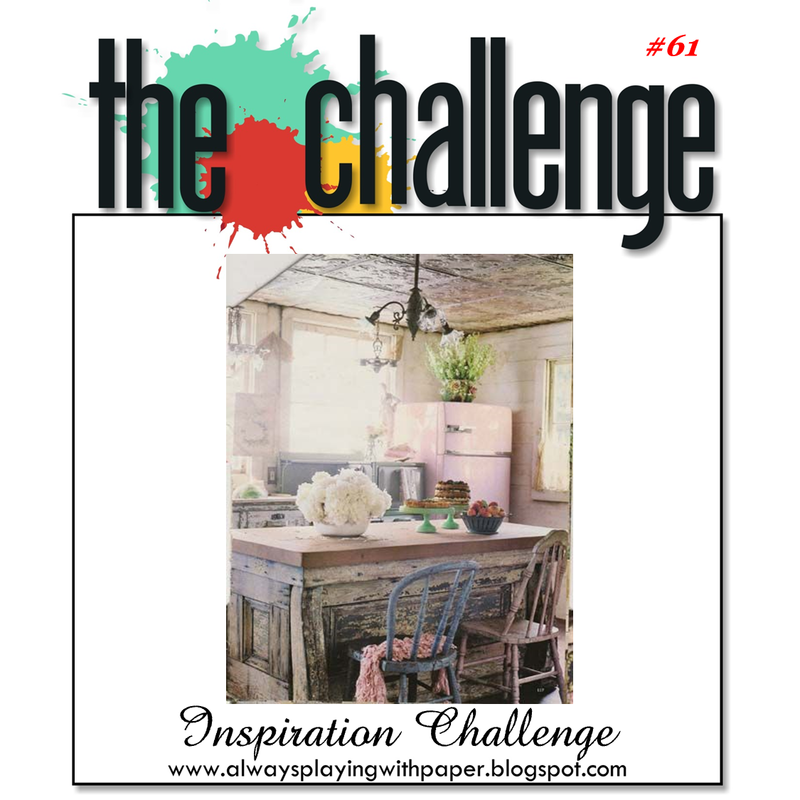 Stop by Always Playing with Paper and take a peak at what the Design Team has created for the The Challenge this week. Play along and have some fun. Good Morning and Happy Monday, we have a new Challenge for you for The Merry Monday Christmas Card Challenge. 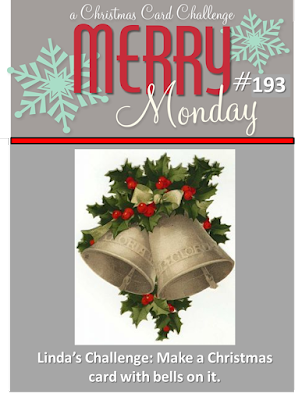 This week Linda's Challenge is to Make a Christmas card with bells on it. A very CAS card for this challenge, I love the old fashioned bells. I added some Wink of Stella to give them a little shimmer and used a simple sentiment that is popped up with foam tape. Supplies: Cream and green card stock, Designer Paper - Carta Bella. 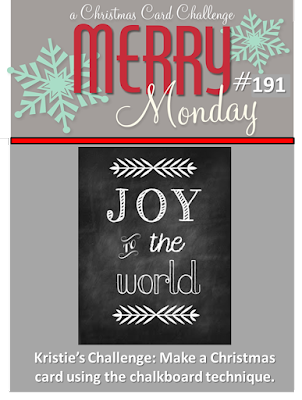 We have a new Merry Monday Christmas card challenge for you. Our hostess this week is Bonnie and we are to Make a Christmas card with berries on it. I created a CAS card, I used a portion of a 12 x 12 sheet of DP, then stamped the sentiment on a die cut tag. I added some red gems and twine. Supplies: White and brown cardstock, Designer Paper -Unknown, gems, twine. 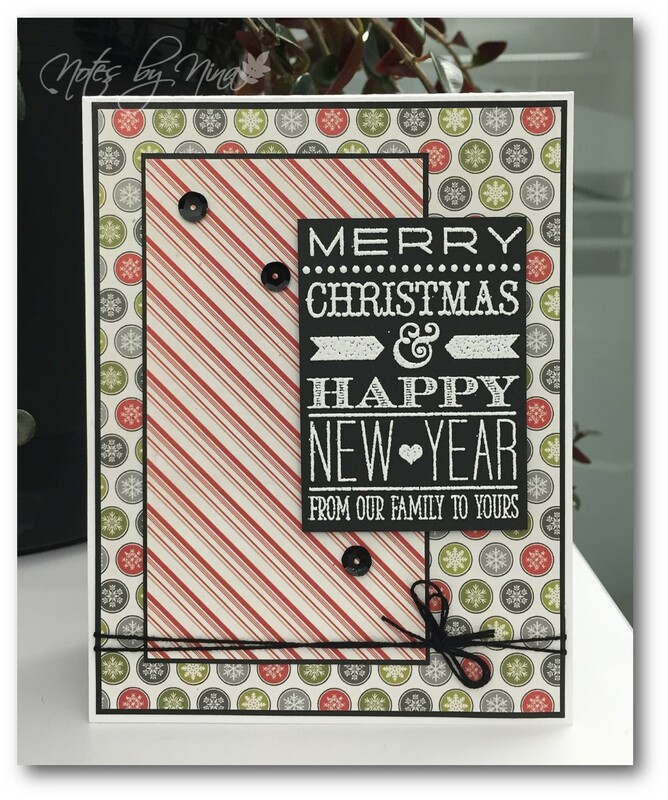 Head over to the Merry Monday Christmas card blog and see what inspiration the Design Team has created and we would love for your to play along. 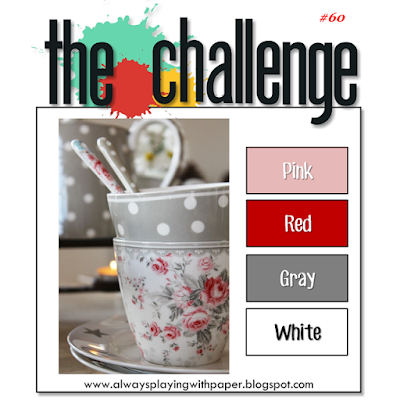 It is time for a new The Challenge over at Always Playing with Paper, this week is a colour challenge. I will admit to a few false starts with this card, all me and my tired little brain. I had a little stretch that was a crafty bust but the inspiration did a 360. I have discovered a love for ombre papers, you know the ones that seem to be the last ones in the 6x6 paper pads. One of my false starts included Distress Inks and creating my own, it looked ok but that is where I kind of just stopped and did not know where I wanted to go from there. That was when I found the grey and pink ombre paper, I added a little card stock frame to each layer. I used my black ombre ink to stamp the xox. I had found some adhesive backed glitter foam sheets at Walmart and I die cut the hearts. Oh what a joy to try to remove the backing from each of those little hearts :). I heat embossed the large sentiment and popped it up with foam tape, I then stamped I love you simply with black ink. 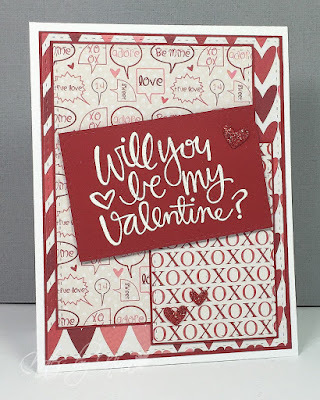 Supplies: White, black and red card stock, Designer Paper - My Mind's Eye, Heidi Swapp - With all my Heart, Simon Says - Paper Hugs, Simon Says die cuts, glitter foam. Stop by Always Playing with Paper and take a peak at what the Design Team has created for this weeks The Challenge. Play along and have some fun. Happy Friday :) I do love these little envelopes, and they certainly make a card come together in a timely manner. The center panel is popped up with foam tape then I added the envelopes and sealed them with glittery foam hearts. 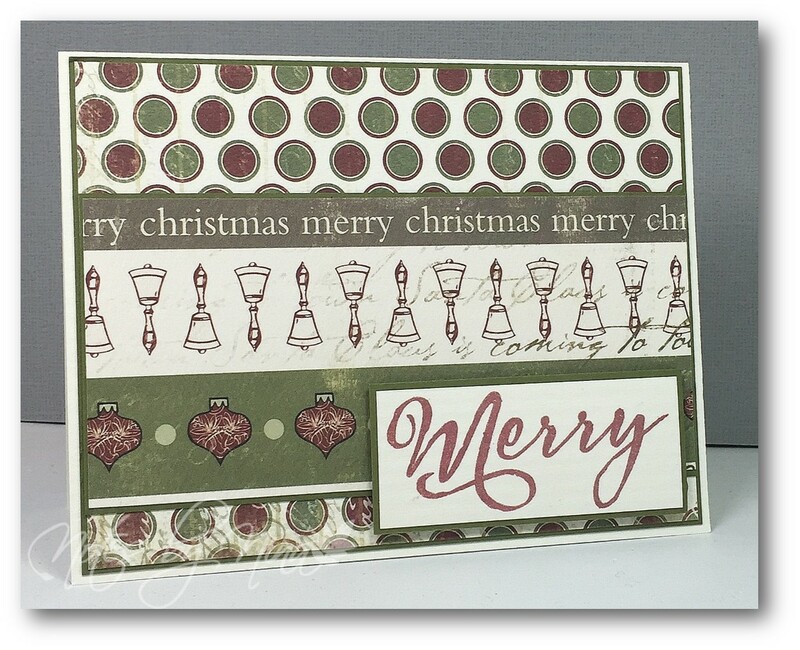 I finished with a white heat embossed sentiment on red and popped it up with foam tape. Supplies: White card stock, Designer Paper - My Minds Eye, Clearly Besotted - Sentimental Type, SS- die cut, misc punch. 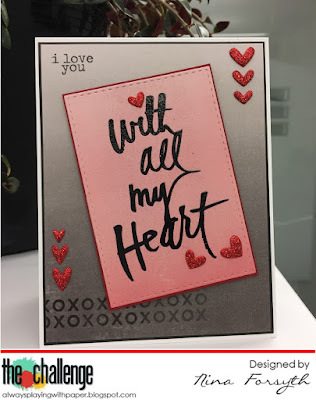 I should name this week of blog posts the week of hearts, my Monday of creativity was admittedly heavy with Valentine's Day cards. This one is pretty CAS, if you follow my blog at all you know that I love it when the paper does all the work. This one is no exception, I love this newsprint with heart DP. How easy it is to heat emboss flags and then hand cut a glittery heart from foam. I am pretty happy with it either way :). I used lots of layers for this card, look at all the papers of love :). 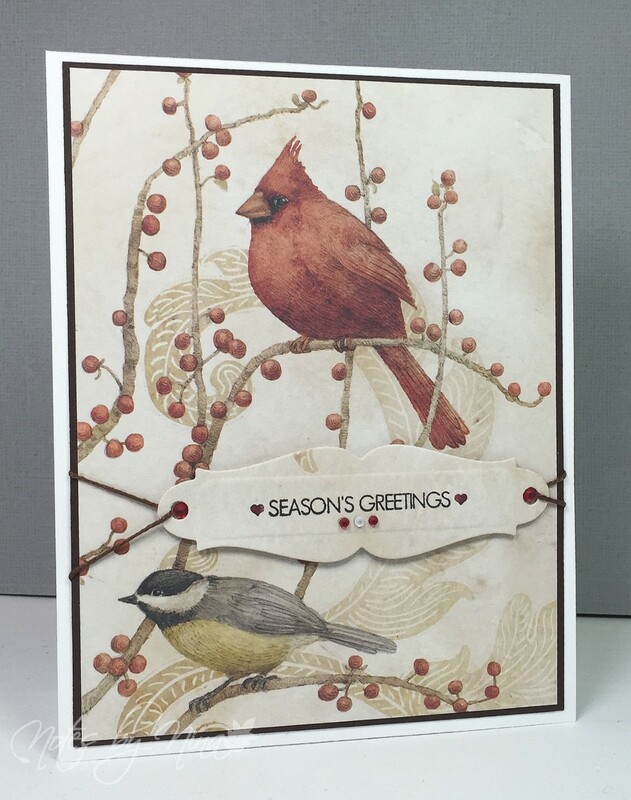 Each layer has a thin matte of red cardstock, I added some detail by using stitched rectangle die cuts. 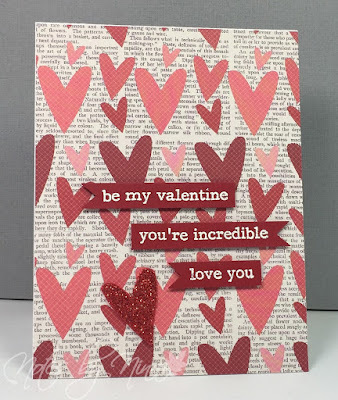 The sentiment is heat embossed in white on the red cardstock and being as I have dozens of little glitter hearts all over my desk how could I not add them. The glitter foam sheets from Walmart were well used this week. Supplies: White and red card stock, Designer Paper - My Mind's Eye, Simon Says - Paper Hug and stitched rectangles, red foam hearts. 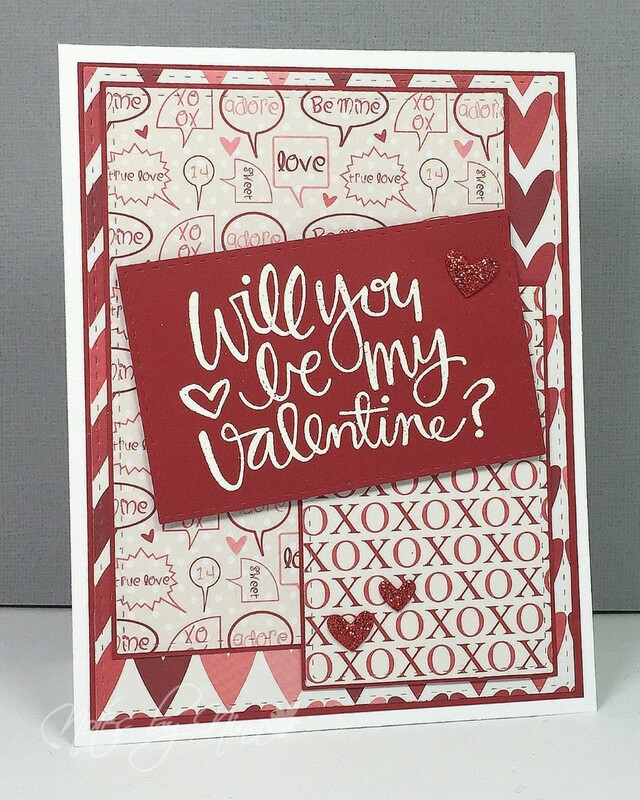 Supplies: White and red cardstock, Designer Paper - Fancy Pants, Glitter foam sheet, Clearly Besotted - Sentimental Type, SS die cut. It is Family Day here in BC so it was a day off and I spend nearly the entire day making cards. I don't think I have been this creative in months. For the background panel I used a stitched die cut, I then stamped the jar twice and fussy cut the second one so I could pop it up with foam tape. I added a thin layer of plastic to make it more glass like. 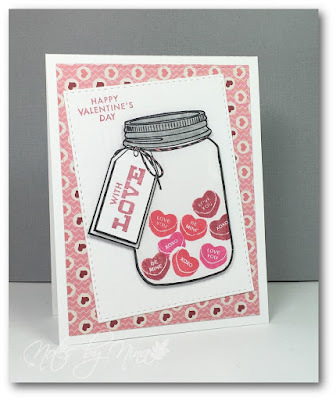 The tag is also popped up and extra layer, I finished by using silver Wink of Stella on the jar's screw lid. Supplies: White cardstock, Designer Paper - My Mind's Eye, Recollections Valentine's Day, Simon Says die cut. Its another crafty Monday and we have a new Merry Monday Christmas card challenge for you. Our hostess this week is Kristie and we are to Make a Christmas card using the chalkboard technique. I have a number of paper pads that have chalkboard papers in it, in the end I did not use any of them and instead heat embossed the sentiment in white on black card stock. I layered a couple of panels with black cardstock and DP, I popped up the sentiment with foam tape then finished with sequins and some twine. Supplies: White and Black cardstock, Designer Paper -Echo Park, Clearly Besotted - Most Wonderful, sequins, twine. 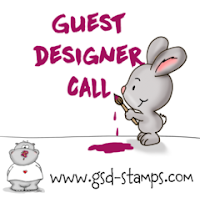 I finally had a little time in my craft space today and I am going to submit this card for the Gerda Steiner Guest Designer Call. 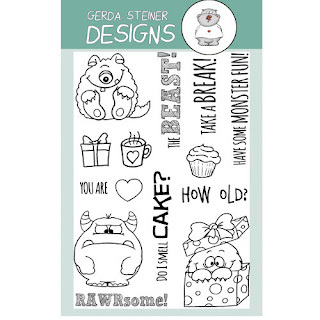 I love the two stamps sets I brought near the end of last year, I have just not had a chance to play with them until now, but I have used the digital stamps in a couple of challenges. I wanted to make a cute Valentine's card for a friend and this almost grumpy faced monster was perfect. 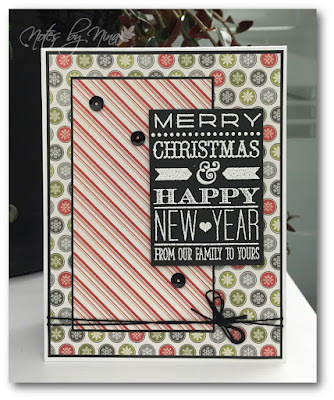 I heat embossed then image then used my Tombo markers and my Wink of Stella to add colour and of course sparkle. 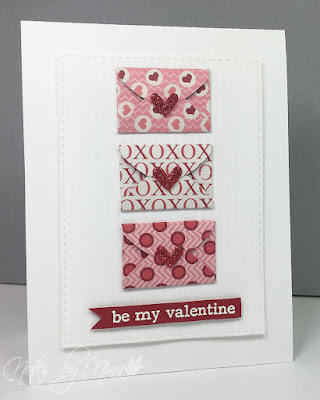 I used a Simon Say die cut to create a panel full of hearts and added a red outline. I popped up the Rawrsome sentiment and the little monster up with foam tape then finished with some sequins. 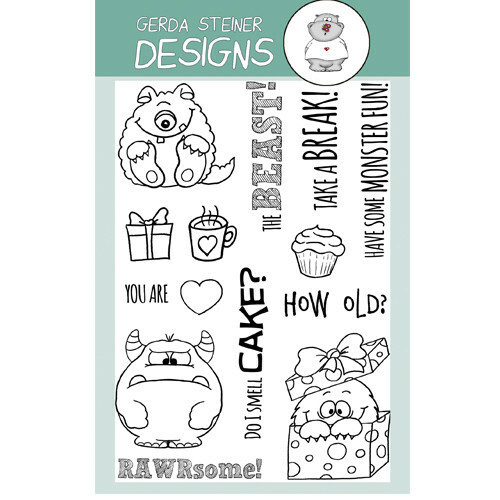 Supplies: White and red card stock, Designer Paper - Fancy Pants, Gerda Steiner - Monster Fun, Simon Says - Paper Hug, Simon Says - Die Cuts, sequins. I love this sketch for the current The Challenge, it allowed me to create this fun coffee themed quick card. I am not really a coffee drinker per say, I like the occasional latte but I love tea. Caffeine does not really give me a boost and a warm drink is more of a comfort and cozy item for me. I do however have family and friends who place a very high value on morning coffee. So back to The Challenge and the card. 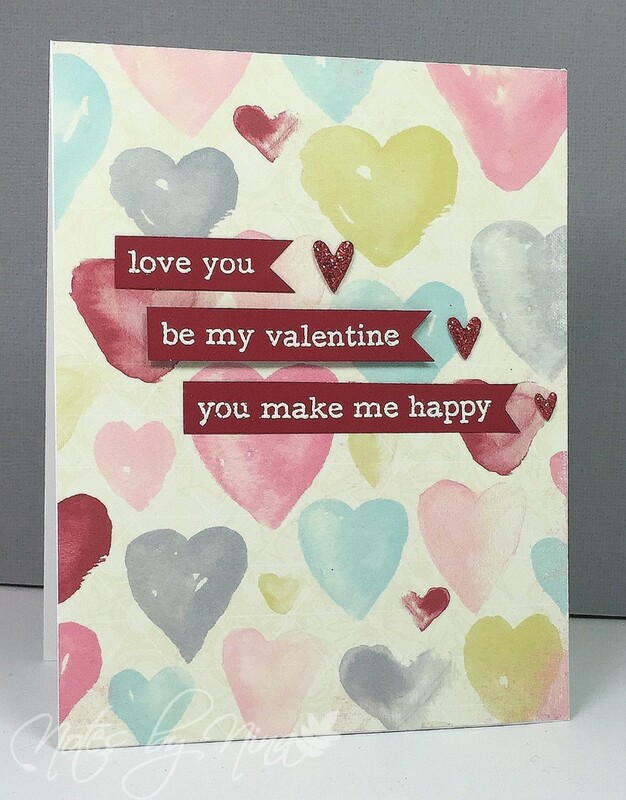 I stamped coffee stains along the side of the designer paper and then added the sentiment. Next I layered a coffee cup with DP and cardstock, the heart is clear heat embossed onto burgundy paper. I added a double ring die cut then popped the little cup up with foam tape. 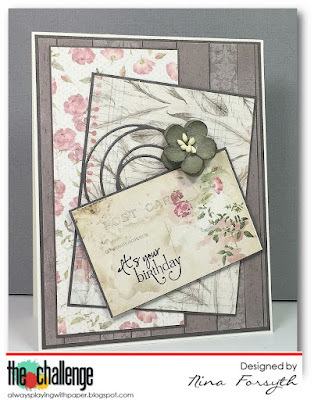 Supplies: Cream and brown cardstock, Designer Paper -Basic Grey, Verve - Better with You, SS die cut. Monday Merry Monday, are you ready for an new MM Christmas card challenge. 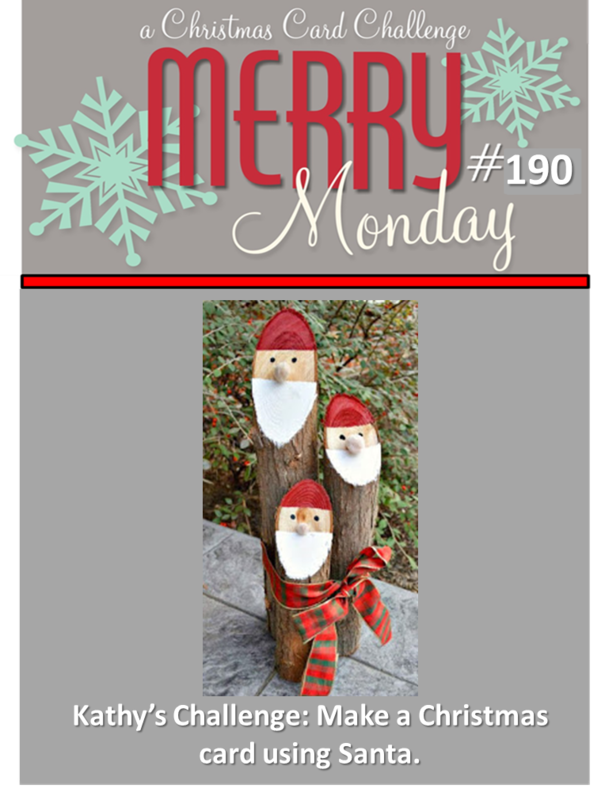 This week Make a Christmas card using Santa. 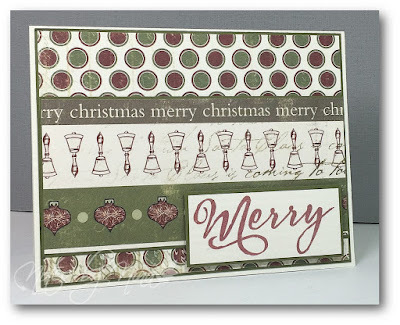 This card did not turn out anywhere near what I was thinking when I started to dig through my little holiday 6 x 6 pads. What caught my attention is on the bottom part of the card. You ever find supplies that you just HAVE to use, like, RIGHT NOW. That was this little part on the paper. Crazy Right? I know! Anyway, crazy aside :). Much to my delight, one of the coordinating pages has a Santa print on it. 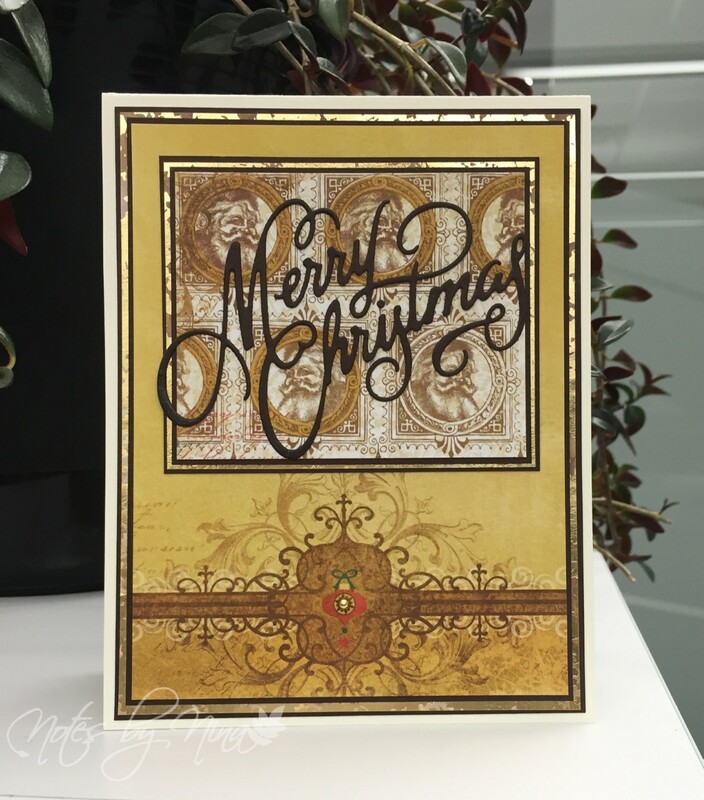 I layer pretty gold paper with brown cardstock, then die cut the sentiment in brown,. I finished with a little gold gem. Supplies: Cream and brown cardstock, Designer Paper - Recollections, Designer Paper - Bo Bunny, Impression Obsession - Merry Christmas, gems. 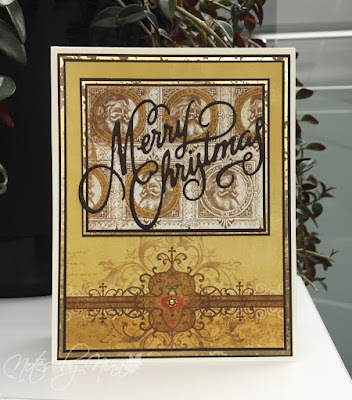 Be sure to head over to the Merry Monday Christmas Card Challenge blog to all the wonderful creations by the design team. Play along and have fun.